I had seen the great idea of taking a photo at our wedding with “Thank You” written on chalk boards, on signs and even in the sand. I just loved it and knew that I wanted to paint a rustic “Thank You” sign to use on our wedding day for our thank you cards. So much more unique and personalized for our guests to receive. Our photographer, Shepard Photography, was great about getting this image edited and over to us within a week of our Honeymoon, so that we could get to work on our cards. I toyed with idea of having cards printed, but decided just to buy blank cards and glue the image to the front of each. It saved quite a bit of money since the cards were on clearance and I think they turned out great! The cards I bought were 5.5″x4″ cream card stock with matching envelopes. I had my 4″x6″ prints made at Costco and the quality was great! 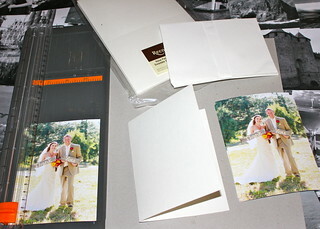 I love Costco photo center Quick and easy tutorial…here we go! 1. Gather up your supplies. 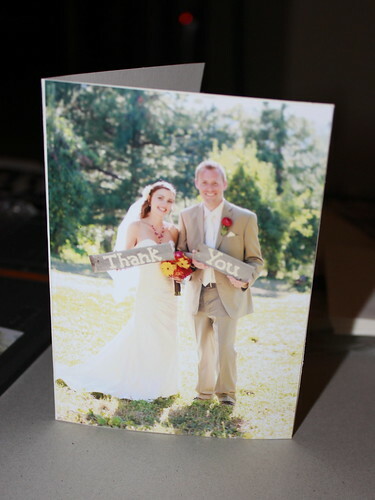 Take all your photos and use your paper cutter to make them 4″x5.5″ to fit on the front of your cards. 2. 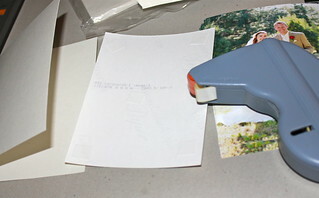 Grab your adhesive and attach each photo to the front of the cards. Write your thank you message to your friends and family and get the cards out in the mail! Easy right?